It’s a thankless task, searching for a job. You send off your CV, or resume, and it joins a thousand other destined for the round file. What on earth can you do to make your career stand out, and catch the eye of the recruiter? 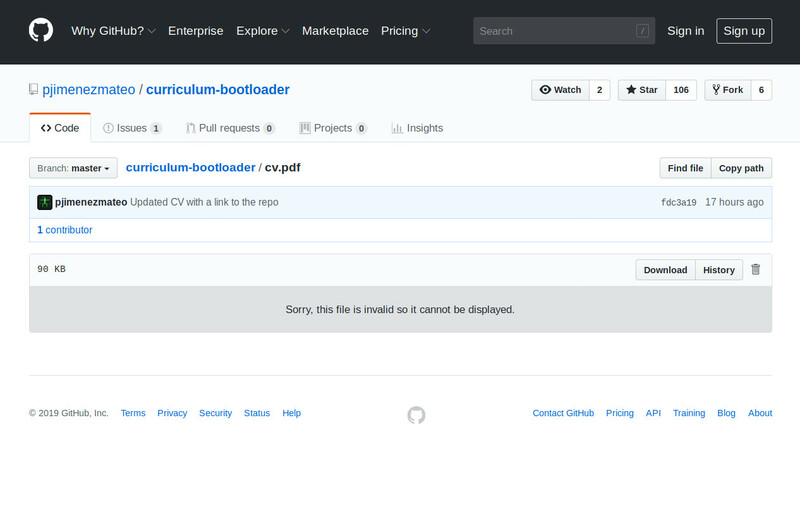 Your bootable CV isn’t eye-catching if the recruiter uses GitHub to view the PDF. If you are [Pablo Jiménez Mateo], the answer is straightforward enough. Simply combine the document as a PDF with an x86 bootloader, to make a readable document that will also boot an x86 computer system. He can do this relatively easily by prepending the bootloader file to the PDF, as long as the “%PDF” header of the CV remains within the first 1024 bytes it will remain a readable document. Which it does, though as our GitHub screenshot shows, not in all PDF readers. A bootable PDF is pretty cool and we have to salute his effort in getting it in front of us in the hope of career boost, but it would be fair to admit that it’s a trick that has been done before. So it’s time to turn attention to the bootloader itself, whose code comes in the form of an extremely well-commented assembly file that loads some sprites and a border to a VGA screen that looks as though it might be the first room in a top-down adventure game. Through the code we can gain an appreciation of just how simple a bootloader can be, and that in itself makes this project worth a second look. If writing your own bootloader interests you, that’s certainly a subject we’ve covered in the past. It’s possible to make bootable images very small indeed, even down to fitting in a Tweet. Of course everyone naturally trusts to boot their computer with some ‘stuff’ that they have been sent! And, of course, all CVs are checked by humans nowadays, with spare time to ‘muck about’ with dodgy executables and disable virus checkers. Not being a spoil sport but the whole premise of this is ridiculous. You should be able to run the code in QEMU. But I believe most people responsible for evaluating resumes for coding jobs will only read the PDF because they don’t.know how to boot it. I’ll had that unless you’re applying for a job at a small business then your C.V. will first go through H.R. which is usually not staffed with tech savvy peoples. If you are in a very large company, the CVs are scanned for buzz word compliance before a non-technical even looks at it. Some HR outsource their initial screening to online ”career” sites which automate the initial screening process. They had a preference of using Word. They extract the text and may be a bit of the formatting info for some keyword matching algorithm etc, so this might either fail or don’t have a effect. There is also the case where the HR hardcopy the pdf to the hiring manager. HR are not (computer) geniuses. Without a doubt one of the most useless impractical hacks I’ve ever seen. HR should NOT boot from random outside media — If they’ve got good IT that option doesn’t even exist for the user so what’s the point. ^That’s funny right there. LOL. It’s the first Zelda game.